This question has been answered by many people including some of my favorite Veterinarians. And I usually laugh at the answers! Why am I so cocky on this issue? I’ve seen a couple hundred dogs eat grass! You ask how could you have seen this? I used to pet sit dogs in my home in Durango, CO. I did this for 6 years and had 3-6 additional dogs to my 3 in my home for an average of 330 days a year. 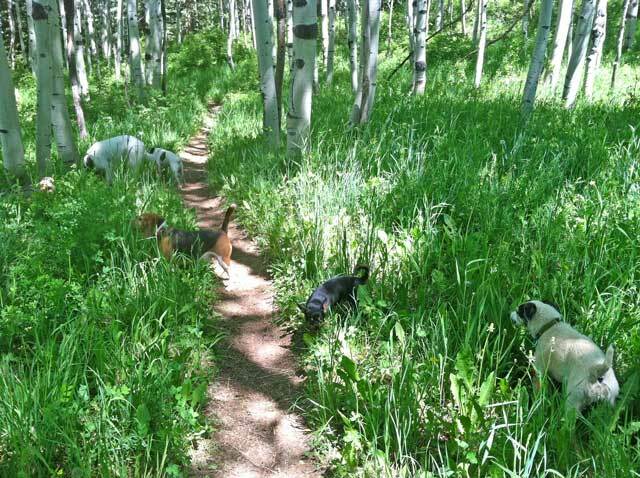 Each day I took the dogs on an off leash hike on trails, sometimes when the pack was right we would venture out for a high country hike in the mountains. Whenever new, wild grass was available, the group of dogs would look like a bunch of cows, all of them munching on the grass. Every single one of them would eat some grass, WHY, THEY LOVE IT. Here’s 5 dogs all eating grass because it’s yummy! My front yard had this beautiful wild grass next to the walkway. I witnessed every dog that came into my house eat grass. I would be talking with the dog’s Mom or Dad and the dog would be munching away on the grass, every time. I never used any pesticides or herbicides on my yard, so it was very safe. Now here’s the kicker… dogs don’t chew up this grass very well, their teeth are not like a cows so they swallow whole blades of grass. Then they sometimes eat too much and what happens then? They throw it up. No biggie, just too much grass was eaten. This only happens occasionally. Just yesterday, we pulled into a new campground in New Mexico and there was a little patch of beautiful long, wild grass. They both dove in immediately and munched a bunch of grass. We’ve been in the desert for months, so this beautiful grass was a real treat. Yahoo for Dr. Coren! He has all the facts and figures in this article, so I am not compelled to put them in my post. He says what I say, dogs eat grass because they just like it, most dogs eat grass and not because they are sick. What you should do? Make sure your dog is not eating grass that could have been treated with any chemicals. I do not let my dogs eat grass at a public park. Also if they are gorging themselves, I ask them to leave it and have them move on. Eating too much of anything is not good. Generally I let them eat grass in a wild spot. Bottomline, your dog is not sick, nor is he trying to kill something in his gut. Your dog eats grass because he likes it!!! I feel 99.99% sure of this. Also, I’m sure that they need the nutrients from the grass, which is why they they continue to eat it. Does your dog like grass? Huh. That’s interesting that they eat it because they like it. I always assumed they were eating it because they were sick or something. Like the grass made them feel better? I dunno. I heard it one time and it stuck with me. Thanks for sharing this fun fact! I promise you, the eat because they like it. Especially wild and new grass. Thanks for the comment. Great post with lovely picture of the 4 furkids munching (amongst birch trees, I think). Love your blog! Thanks so much for the comment and the visit. Replying to your test comment on this post to see what is happening. Hey Jill. Thanks for testing the comment section. Let me know what happens.